The Age of Redemption 2017 mod is designed to extend content for the Vampire the Masquerade – Redemption PC game available on Steam and GOG. 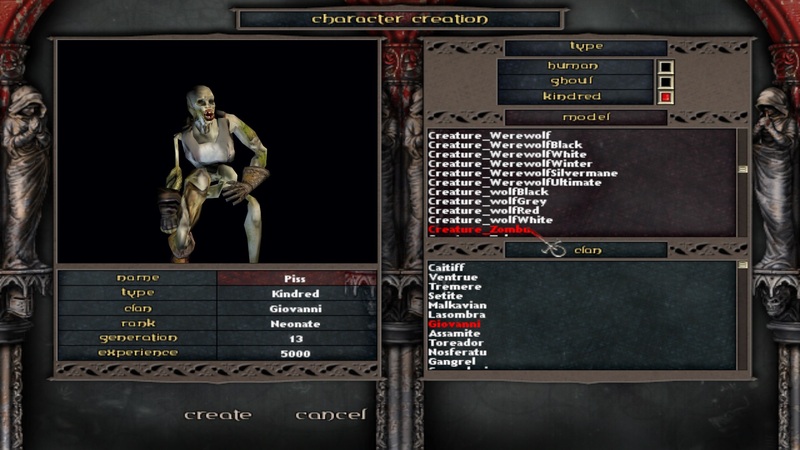 You will need Vampire the Masquerade – Redemption to use this mod. The Age of Redemption 2017 Mod allows for the single player chronicles to function in multiplayer without quest-breaking bugs. Additional features include enemy respawn, vampire the masquerade pnp friendly damage/soak rules, ranged weapons use multiple ammo types, advanced AI protocols make better use of disciplines and equipment loadouts,	better control over your coterie AI through a config app as well as in-game coterie AI controls, adjustable difficulty, and more! Welcome to the Age of Redemption. This modification is intended for fans of the original Vampire the Masquerade – Redemption single player experience who are seeking a more revitalized take of the original game. 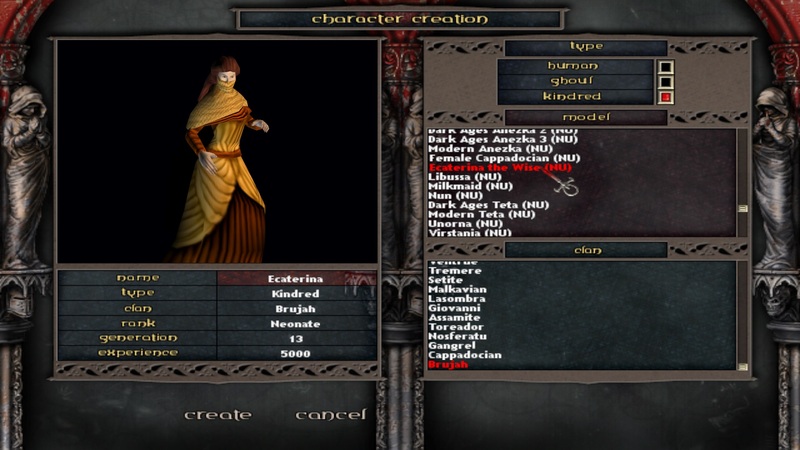 The Age of Redemption mod is intended to fix several issues that existed in the original game including the lack of a functioning multiplayer coop mode for the single player epic campaign. Age of Redemption IS NOT A PATCH; it’s an overhaul. Age of Redemption goals to make major changes to the gameplay mechanics, maintain multiplayer coop support, and alter level designs all for the purpose of modernizing the gaming experience. The original Vampire the Masquerade – Redemption came out in a time where Diablo 2 was launching and gaining quick popularity. There appeared to be an intent from Activision and Nihilistic to compete against Blizzard’s flagship game. 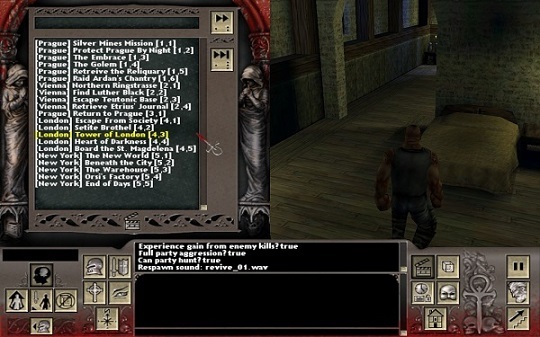 Unfortunately, there was neither enough time nor resources to complete the project so we were left with a half completed, yet epic, title that featured some World of Darkness elements, but with a hack & slash style similar to Diablo. Instead of trying to remove this style, Age of Redemption was aiming to finish what Nihilistic started in our own way and of our own vision. So if you’re a fan of Diablo and have no trouble with a hack & slash style game then Age of Redemption is your kind of mod. Support for multiplayer through the Age of Redemption chronicle that appears on the multiplayer game selection list. It’s one big chronicle so no more need to end the multiplayer game when transitioning from Prague to Vienna and so forth. All five chapters of the single player game are molded into one epic game session. This also helps solve a crash issue with transitioning to Vienna. Also allows the ability to advance the scenes using the ST scene list panel. Great for playing in sessions then coming back later to progress further with your friends! AoR’s enemies now make logical rather than random use of disciplines. In addition, props and various other obstacles no longer hinder the AI’s not-so-great navigation. The AI will now call for backup from nearby allies, open doors and activate switches to get to where they are going, use special discipline tactics in combination. NPC’s now use equipment loadouts rather than one weapon and one item drops. NPC’s will use up ammo from their inventory when firing ranged weapons. When an NPC runs out of ammo, they look for more ammo in the area or switch to melee. The AI also has better line-of-sight checks than the original game and wont waste ammo shooting at a wall; instead, the AI will re-position to attempt a better angle and to possibly flank the enemy! Several changes have been done to many levels. Some were minor fixes, others may appear a bit more obvious. You’ll need to look and compare for yourself. More drastic changes to the level design are planned in later releases of aor. Several discipline modifications have been done. Many had statistical changes to balance them out to make them worth spending more than one dot on. Others were given visual alterations. Then there are disciplines that have changed in characteristic and function. You need to explore the new descriptions for each of the disciplines to find what has been changed most. New Disciplines added. Obtenebration now has a full array of powers available all created around the idea of suppression and evasion. Movement of the Mind has also been added and includes powerful “jedi” like powers to disarm enemies and use an enemy’s weapon against them. The poisonous powers of Quietus will bring ruinous demise to your enemies. The Beast is a much more deadly and pervasive part of vampiric existence. Frenzy no longer fiddles around based on damage and discipline use. The frenzy stat rises based on overall stress during combat, discipline curses, and hunger around mortals. Frenzy no longer reduces completely over time. Resisting the beast requires a successful wits check during frenzy check situations. Failure will result in an increase to frenzy equal to “frenzy rating” that is based on clan, difficulty, perks, and equipped items. Wits can be modified based on current blood, generation, and humanity. So keeping a high wits, full bloodpool, and high humanity can all help increase one’s resistance to The Beast. If your frenzy stat goes up to 100 then you will frenzy. Recovering from frenzy can take much longer than vanilla because the frenzy stat will not start reducing till after the stress of combat is over. When combat is over, you will still have to “calm down” based on wits and charisma. The higher the wits and charisma, the faster you will recover from frenzy. Failure to “calm down” will result in seeking trouble around the area against the controller’s will. The vampire will be more reckless while no longer accessing important discipline strategies in combat while frenzied. Enabling the “Show Combat Status” feature in the config app will present more information about the status of The Beast. Vampires need blood to survive, but not any blood will do. In Age of Redemption 2017, you now have to take blood quality into consideration when feeding. Drinking from another vampire is now a dangerous prospect as new factors like Kindred Vitae Addiction, Diablerie, and Blood Bonding can be an issue [or a desire]. Vampire’s suffering kindred vitae addiction can no longer find sustenance from mortals, causing the vampire to puke out any mortal blood they feed from. Diablerie can have terrible consequences for vampires on the path of humanity. Being blood bonded in Age of Redemption can cause one vampire to be bound to the unlife of another, resulting in severe penalty to the bonded vampire upon the death of their bonding master. Unlike in vanilla, other limitations have been put on feeding based on clan. The Ventrue can only feed upon good quality blood or suffer vomiting fits on anything lower. Forget feeding off of creatures like Zombu, that’s no longer allowed in AoR. When hunting mortals, be mindful of the target and not all are created equal anymore. Every vial of vitae and every mortal have a variable amount of blood quality and “special effects” which can be positive or negative depending on who is doing the hunting. Weapons have been overhauled across the board. From rare artifacts to standard firearms; everything now feels a bit different with the Age of Redemption mod. Ranged weapons now reload properly and many ranged weapons accept different ammo types rather than having to switch to a different weapon (e.g. Crossbow to Incendiary Crossbow and so forth). Scripted artifacts like the notorious Ainkurn Sword have been altered and rebalanced while still keeping to their original intended purpose. Grenades and other	thrown weapons now go much farther than 3 feet as well as allowing the user to move immediately after throwing. Emod animation abilities also added and include a more robust and flexible set of animations that allow players to be as silly or dramatic as they like during their coop MP play! Orsi’s Penthouse can be purchased during the modern day New York chapter. It’s expensive so save up that cash from all the loot you get from the respawning enemies. Age of Redemption also maintains functionality in the in-game AI Coterie Controls options under Options\Controls in the game menu. This can work in conjuction with the Age of Redemption 2017 config app allowing much more robust control over your coterie’s actions. The Age of Redemption mod allows for full support for playing the Redemption single player game in multiplayer. 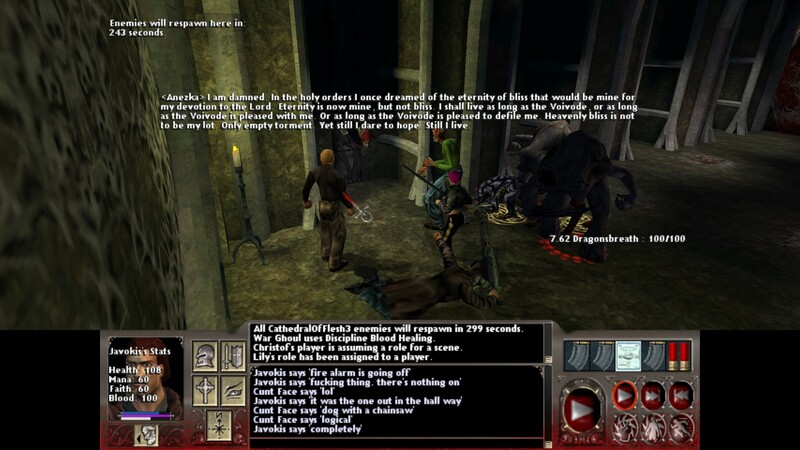 The Vampire the Masquerade – Redemption single player chronicle had been combined together into one large chronicle. This means no longer having to quit the game to move on from Prague to Vienna. 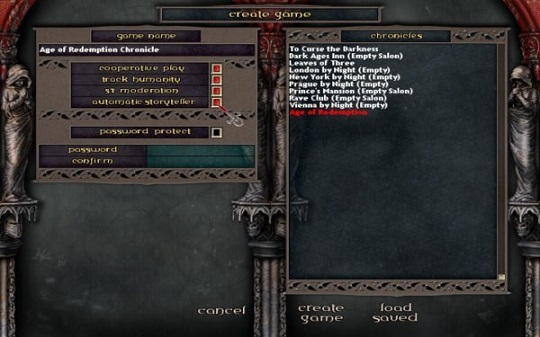 The Age of Redemption Chronicle should appear on the list of available game options in the multiplayer game creation screen. 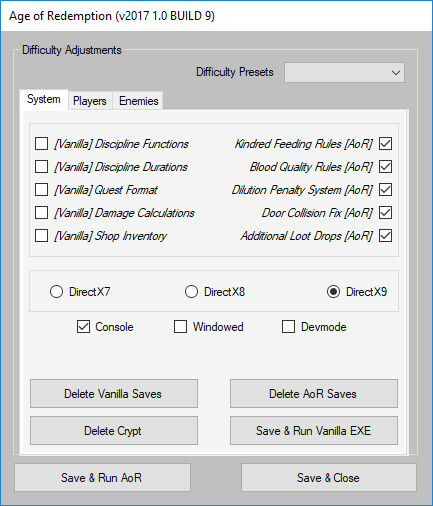 Also note that the AoR Mod v2014 has added support for turning off automatic storyteller, which will allow for freeform gaming and storyteller control. The Age of Redemption chronicle loads all of the template databases at once and is very strict about having seperate addons installed. So far, I have tested MoTA, Giga, Creature Mod, and White Rabbit packs. Unfortunately, the Age of Redemption chronicle is not compatible with installing all model packs available at E-Mods.net. This issue will be addressed over time and is a constant work in progress. If a crash occurs or your running a chronicle in short sessions with your players then you may also advance the scenes in multiplayer using the ST Advance option. If you are using freeform gaming then you may want to advance the scenes with a location segment so to unlock all exits to allow total exploration in that segment in multiplayer. Example is when you want to just allow players to roam around Prague freely then you can go to ST Advance after shutting off the Automatic Storyteller then choose the [Prague] Raid Ardan’s Chantry [1,6] scene. Now everyone can go where ever to grind in either the Monestary, Silver Mines, Joseph’s Tunnels, or Ardan’s Chantry. This application is used to run the mod and requires .NET Framework 4.6.1 to run. Be sure to run this program as Administrator or it may not fully function. If a player travels to a level before the ST, many conversations wont show proper animations or lip synch. To resolve this issue, the ST should always travel ahead of the other players to synchronize stuff. If a crash occurs attempting to start a Multiplayer LAN/Internet game then check the Crypt folder located in the main VTMR directory. Delete all content within the Crypt folder. NOTE: the Internet option no longer works since the servers it connected to are no more. Use Tunngle to connect via vpn then use the LAN feature in-game instead. Regular game sessions are played via the Vampire the Masquerade – Redemption channel on Tunngle so check it out.